The corner stone of healthy skin lies in the moisture content of your complexion. While multiple factors go into preventing the most common signs of aging, one that can't be disregarded is the importance of keeping your skin hydrated. Moisture is important and without it your outer layer can't act as a barrier and protect you and your skin from infection. Whether your skin is dry, oily or somewhere in between, moisturizing from within and without is the key to keeping it soft, smooth, plump and youthful. The Process of Maturing (Aging) � With age, your skin's natural ability to hold onto moisture is depleted. The less water in your skin cell, the drier your skin becomes. Free radicals and inflammation are partially responsible for inhibiting your skin's ability to retain water. The Weather � When the air has no moisture, you're sure to get dry skin. Dry air causes the evaporation of moisture in your skin. Low humidity forces the enzymes in your skin to look for a source of hydration that leads to dry patches. Ingredients � While alpha hydroxy acids (AHAs), glycolic acids, salicylic acids and retinol can be great for certain skin challenges, they can create one. You know it as dry skin. They can often dry your skin out leaving it flaky. The Sun � UVA and UVB rays deplete your skin of moisture. UV rays break down the collagen and elastin levels of your skin and make it rough to the touch. Over Washing Your Skin � Did you know that cleansing your skin too much can strip away its moisture? It�s best to use a mild cleanser. Too much soap, alcohol or cleansers with detergents, will throw your skins pH level which results in a lack of hydration. 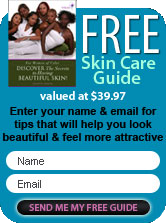 Chronic Skin Conditions � Skin conditions like eczema can disturb your moisture levels and your skin texture. Spinach �This veggie is high in vitamin A, which wards off dryness. Green vegetables like cucumbers pack a serious dose of silica and this helps in keeping your skin hydrated and elastic. Delays the appearance of fine lines, sagging jowls and wrinkles. Water � You know that constantly drinking water will hydrate you from the inside out. Water will also flood your skin cells with moisture and restore your skins natural barrier function. Omega- 3 - Foods like salmon, tuna, olive oil, and flax seed are high in omega 3 fatty acids. Omegas 3's moisturize your skin and plump up lines and wrinkles and yes we get fine lines and wrinkles. Maybe not as many as some but they show up and you want to be working a head of the curve. Berries � Berries of all varieties contain vitamins and antioxidants that protect and strengthen your skin. Hydrating your skin should be part of your black skin care regimen on a daily basis.